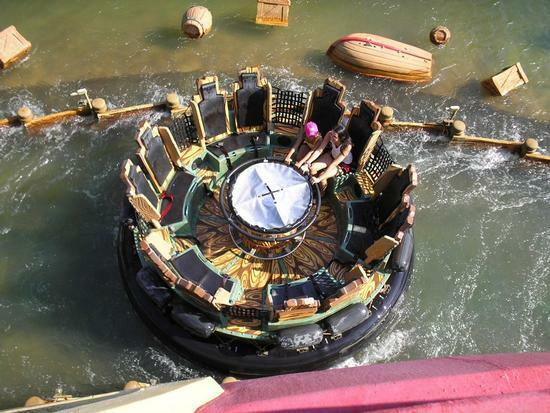 Popeye and Bluto's Bilge-Rat Barges is a rapids ride in Toon Lagoon at Universal's Islands of Adventure. While it's not the best, it is also recommended. The minimum height to ride is 42 inches. A river rapids ride, featuring characters and gags from the King Features and Fleischer Studios’ cartoon starring the spinach-guzzling sailor man. Arch-enemy Bluto is up to no good again, and there’s no escaping an underwear-soaking drenching on this water ride, where on-lookers can get in on the action by spraying you as your tub raft washes by. This is best of all the "round raft" rides that I've been on. You're never sure who is going to get soaked or when.